In the quarter preceding the last, which was Q4 of 2018, Tesla sold and delivered 61,650 Model 3 cars to American buyers. In this past quarter, which Tesla has just reported on, sales and deliveries of the Model 3 dropped by more than half that number to just 22,425. In fact, Tesla sold more cars last December than it did this January, February and March combined. Tesla's stock value dropped about 10% after news of the report became public and the stock market opened. Tesla's Model 3 reached its full monthly production level last August after a six-month delay. Tesla proudly boasted about having reached a capacity of 5,000 Model 3 cars in June of 2018, saying it had overcome the last major hurdle to its production problems. So why did Tesla's U.S. sales drop off so significantly this past quarter? There are three main reasons. First, Tesla was unable to continue growing its production capability. Tesla says in its quarterly filing that it produced about 77,000 vehicles during the quarter, and we know that about 69,500 of those were Model 3 luxury/performance sedans. That points to Tesla's average weekly output of Model 3s as being about 5,000 cars per week. That is the same rate Tesla boasted about having reached nearly a year ago. The fact is that Tesla can sustain short periods of full production of the Model 3, but the automaker cannot continue to add production unless it adds significantly more capacity. For details on Tesla's promises vs. its realities regarding production please see our prior report from December of 2017. The second reason that Tesla's U.S. sales are down significantly is that Tesla opted to artificially prolong the demand of its Model 3 in the U.S. by restricting availability. It did this by shifting sales to other markets. Instead of filling orders by U.S. customers, some of whom have waited years for a Model 3, Tesla opted to instead begin sending cars to its outlets in Europe and Asia. Tesla's Elon Musk proudly showed off images on his Twitter feed of his zero tailpipe emissions Modle 3 cars being loaded onto massively polluting transport ships for the long burn to other markets on other continents. Generating great headlines by selling high percentages of vehicles into small car markets is good for publicity and also serves to keep the demand hype up for the Model 3 in the U.S. The third reason that Tesla's U.S. sales slowed is that Tesla opted not to deliver the cars it promised it would. Tesla announced in February that the company would, after three years of promises, begin to fill orders for "$35,000" Model 3 cars. Which it actually prices at $36,200. Tesla said that the orders would begin to be filled, and cars delivered in "two to four weeks." Here, Tesla simply lied to consumers. We spoke to a Tesla sales associate this week at the single New England delivery location who told us he had not seen a single "$35,000" Model 3, called the Standard Range. Not one. Nor have any owners shown off a new Tesla Standard Range on any Tesla clubs. Tesla instead seems to have baited consumers to this new lower-priced model and then conducted a switch campaign to upsell them to higher priced trims. The term "Bait and Switch" is now commonly applied to Tesla's sales practices, even by its most loyal Tesla advocacy publications. 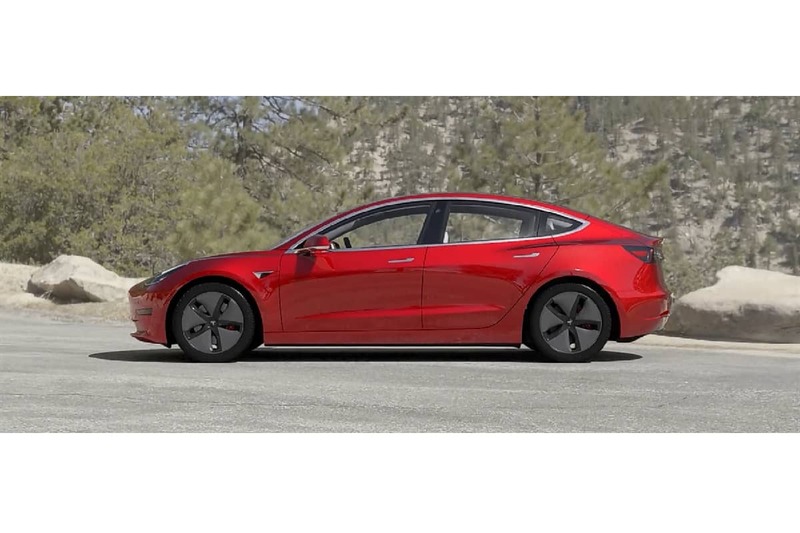 Demand has waned so much for the Tesla Model 3 cars that Tesla will build, those being the pricey luxury/performance trims, that Tesla is now discounting new, never driven, never displayed vehicles. Just like most car dealers do. Tesla called this author with an offer of $2,330 off of such a Model 3. Other customers have reported similar discounts. Going forward, Tesla can still be expected to find buyers for the Model 3. Overseas markets a long fossil fuel ship ride away will absorb quite a volume of Model 3 cars. The demand could last for many years. However, here in the U.S., Tesla proved this past quarter that it needs to conduct promotional campaigns to lure buyers with offers of low prices and then frantically upsell and discount the Model 3 in order to sustain its sales of the now nearly three-year-old model. Tesla also now has legitimate competition. We drove a Kia Niro EV this week back to back with the Model 3 and found it to be more fun, more practical, and lower in its expected cost to consumers than the Model 3 Standard Range Plus. Hyundai also has a Model 3-sized vehicle, its Kona, arriving at dealers soon. At the top end of the Model 3's price range, the Jaguar I-Pace is a tempting option. Tesla also has another problem. The federal tax credit is slipping away. By the first of July, it will be dramatically lower for Tesla buyers than for buyers of Nissan, Jaguar, Kia, Hyundai, and other brands' EVs. That is, unless Tesla's lobbying efforts for this special interest tax break for wealthy buyers succeeds. Author Note: The author holds no Tesla stock and has never traded Tesla stock or options. Source Note: Tesla's U.S. sales figures courtesy of our trusted source of Tesla data, Inside EVs. Stock chart courtesy of NASDAQ and Google. You do fail to mention that even though the Model 3 sales are well down from their December peak, the 22,000+ sales are nearly equal to ALL the other competing EV sales combined. So it's hardly a sales failure in the greater sense. It is true that new sales are down from the big push from late last year, and also true that Tesla is now concentrating on filling long overdue Model 3 orders from overseas, as well as the pre-order sales of the standard Model 3. None of this should really be a surprise. And even though you can make a comparison to the Bolt and Kia Niro models to the Standard base model, the Model 3 is not a crossover, and offers EV performance capability that no other automakers can come close to approaching at it's price (even considering all available options). So for today, the Model 3 Performance has no direct EV competition. Plus no other brand offer An equal Tesla charging network. No other brand offer over the air updates Tesla's Dont spin their tires but they take off like a bullet. Tesla also has a superior network.Tesla's also have frunks the other brands don't offer. All solid advantages. What does that have to do with the Tesla sales figures? Some of this report is incorrect, myseft and my brother-in-law bought new tesla 3's I opted for the midrange and my brother-in-law the us model. We upgraded because we wanted more options Not because of bait and switch. This sound like like anther report trying to discredit Tesla an Amercan based co. Not Korean. Besides kia can't Even get enough batteries to compete. Nor can any of the completion even do over the air updates You would have to bring your car in for any computer updates. No car manufacturers can compete head to head with tesla technologies. I know was interested in the Kia Niro. But the tesla 3 has more storage room trunk a frunk and more, I am a Nurse doing home visits and I need to bring a lot of supplies Tesla has made my life easier With super fast navigation. Something Kia could not offer. Let's not forget no other brand has the wide spread Tesla charging network offered at lower Charging costs then no name brands. Which part is inaccurate? Did you mean to comment under ourt story comparing the Kia Niro EV to the Tesla Model 3 Standard Range Plus? The Kia Niro has more cargo area than the Model 3. 18.5 cubic feet, about three more than the Model 3. Plus the ability to drop the rear seats for expanded cargo capacity. We called the Model 3 frunk "Nifty" in our comparison.